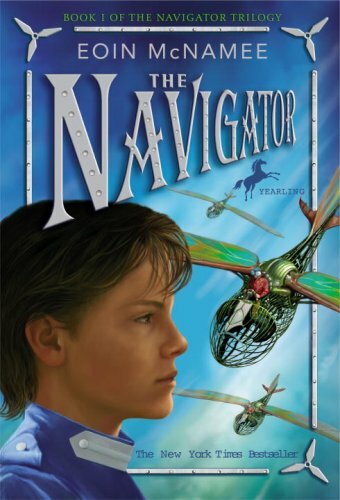 The Navigator, by Irish author Eoin McNamee, is a fantastical book of challenges and courage. Owen is a boy who has lost his father forever, and whose mother has been suffering from a deep depression ever since. Owen has a secret place where he goes to be by himself regularly. One day whilst in his secret ‘den,’ he is caught in a powerful suspension of time. Time is being forced backwards by the Harsh, a group of cold-hearted ice people, who are trying to eradicate humans from the earth. The only person who can return time to the present is the Navigator. Owen, Cati, and other Resisters – all of whom Owen meets in this suspension of time – set out to find the Puissance, a place where it has been foretold that the Navigator can fight the Harsh and restore time. With a fairly heavy, yet calm, introduction, McNamee paces this fantasy so steadily, that the excitement in the last third of the book makes it one worthy reading. City of Time, sequel to The Navigator, releases on June 24, 2008.